My absolute favorite place in Georgia Aquarium, which happens to be the world's largest Aquarium—and that's not the only thing that makes it such an incredible experience—is the "Tube" in the Ocean Voyager gallery, but the room with the gigantic acrylic viewing window (pictured below) is a close second. And my favorite animal in Georgia Aquarium is the Manta Ray (pictured above). 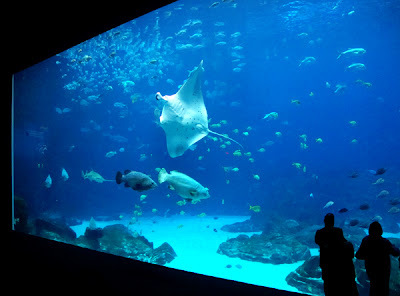 Did you know that the four Manta Ray at Georgia Aquarium are the only ones in an Aquarium in the United States? Ever?! They're fascinating creatures...I could watch them for hours (and counting collective visits, I have!). As much as I love the Manta Rays, one of the things that I love about Georgia Aquarium is its diversity. The fish and other salt and freshwater creatures, from Octopus to Sea Dragons and Piranha to Dolphin, are more than enough to keep any visitor fascinated for the duration of a decent length visit. And they're open seven days a week, unlike many other Atlanta attractions.Actually, they're open every day of the year! Enjoy your visit and let me know what you think of the tunnel and giant window viewing room!